"Fall" Inn love with Colorado’s golden Aspens and Holden House romance! HOLDEN HOUSE 1902 BED & BREAKFAST INN TOASTS SILVER ANNIVERSARY IN 2011-Longtime innkeepers savor 25 years of hospitality! 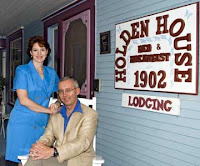 GUESTS PICK HOLDEN HOUSE B&B INN 2011 "BEST FOR HANDICAPPED ACCESSIBILITY"! Holden House Bed and Breakfast surrounds guests with Victorian splendor and romance!